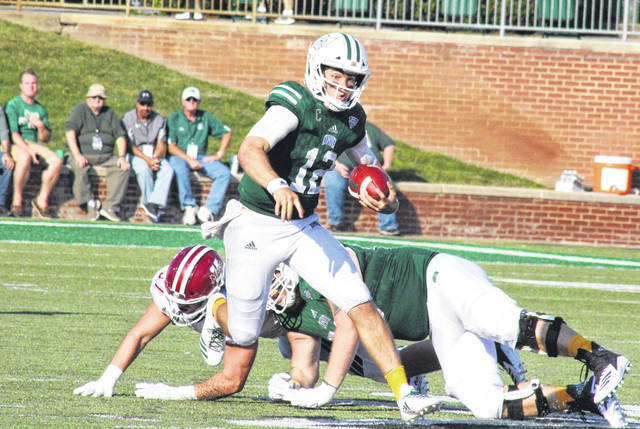 Ohio University junior Nathan Rourke (12) scrambles for a gain, during the Bobcats’ 58-42 victory over non-conference guest UMass, on Saturday at Peden Stadium in Athens, Ohio. 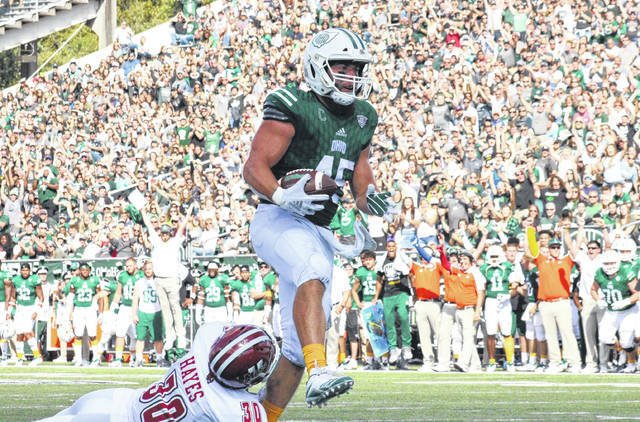 Ohio senior Joe Lowery runs after a catch, during the Bobcats’ 58-42 victory over UMass on Saturday in Athens, Ohio. ATHENS, Ohio — Offense in abundance. 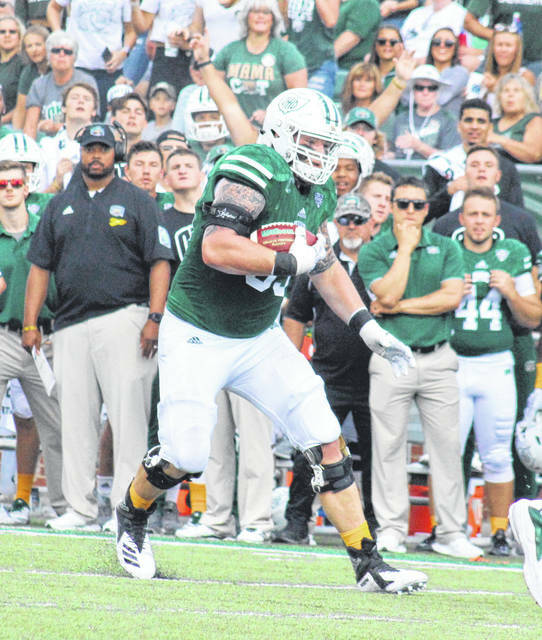 The Ohio football team posted a program-record 664 yards of total offense, as the Bobcats clawed back from a two-touchdown deficit to take a 58-42 victory over non-conference guest Massachusetts on Saturday afternoon inside Peden Stadium. The Minutemen (2-4) — an FBS independent — covered 75 yards in six plays to break the scoreless tie 1:41 into play. UMass senior Andrew Ford connected with Andy Isabella for a 39-yard scoring pass, with Cooper Garcia making his first of six extra point kicks to give the guests a 7-0 lead. The Bobcats (2-2) tossed a pick-six on their first drive, with Isaiah Rodgers returning the interception 55 yards. Ohio bounced back on its ensuing drive, covering 60 yards in eight plays, with Nathan Rourke tossing a 19-yard touchdown to Papi White to complete the possession. Louie Zervos made his first of seven straight point-after kicks, giving cutting the UMass lead in half with 6:23 remaining in the first period. The guests needed less than a minute to answer the Bobcat touchdown, going 69 yards in three plays, with senior quarterback Ross Comis finding Isabella for a 37-yard scoring pass. 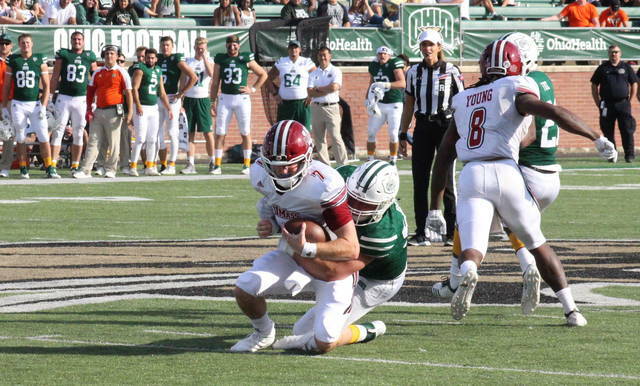 Ohio trimmed the UMass advantage back to seven points, at 21-14, with a seven-play, 68-yard drive that was capped off by a two-yard touchdown run by Rourke. The Green and White defense came up with its first stop of the day on the ensuing UMass drive, and Ohio’s offense took the game into the second period. With 13:36 left in the half, OU senior Maleek Irons broke a 16-yard touchdown run to tie the game at 21. The Bobcat defense provided another stop, but the hosts were pinned back to the OU 12 after the punt. Ohio covered the 88 yards in eight plays, with Rourke finding White from 12 yards out to give the hosts a 28-21 lead. Massachusetts responded with a 16-play, 90-yard drive that took 5:45 off the game clock. Ford tossed a four-yard scoring pass to Sadiq Palmer with just 2:02 left in the half, tying the game at 28. It was just enough time for the Bobcats to restore their seven-point lead, as Rourke capped off a nine-play, 78-yard drive with a 14-yard scoring pass to A.J. Ouellete. The Bobcat lead grew to 14 points on the first possession of the second half, as Ouellette broke a 49-yard touchdown run. The guests answered on their first offensive play of the third quarter, with Ford tossing a 55-yard touchdown to Isabella. Ohio covered 62 yards on its next drive, but was forced to settled for a 36-yard Zervos field goal, giving the hosts a 45-35 lead with 7:06 left in the third. The Bobcat defense forced a turnover on downs and then Ohio’s final touchdown of the day came with 2:40 left in the third, as Irons scored on a six-yard run to make the lead 52-35. After another turnover on downs, Zervos connected on a 22-yard field goal with 10:15 left in the game, making Ohio’s lead a game-high 20 points. The Minutemen broke their drought with 8:05 left in the game, as Ford tossed a 19-yard scoring pass to Samuel Emilus. Ohio punted for the first and only time in the game on its next drive, but junior Javon Hagan came up with an interception to restore possession. Zervos made a 25-yard field goal with 2:26 left for the 100th point of the game, putting a bow on the 58-42 victory. Following his 99th win with the Green and White, 14th-year head coach Frank Solich was proud of the way his team fought back from an early deficit. Solich, along with Ohio, improves to 4-0 all-time against the Minutemen. OU claimed a 34-to-23 advantage in first downs, and was 8-of-13 on third down tries. The Bobcats rushed for 397 of their 664 offensive yards, while UMass threw for 410 of their 451 total yards. The hosts were penalized four times for 45 yards, while the Minutemen were sent back eight times for 77 yards. Both teams committed one turnover, with Ohio claiming all-3 of the game’s sacks. Solich acknowledged that the defense wasn’t where it needed to be early, but improved throughout the game. For the Ohio offense, Rourke led the way with a career-high 189 yards and one touchdown 16 carries, to go with a career-best 23 completions in 32 attempts for 270 yards and three touchdowns. Irons set a new career-high with 140 rushing yards, to go with two scores on 13 carries and seven yards on one reception. Ouellette carried the ball 12 times, earning 70 yards and a touchdown, while catching one 14-yard touchdown pass. White hauled in six passes for a team-best 86 yards and a career-high two touchdowns. Andrew Meyer finished with six receptions for 60 yards, Cameron Odom added 44 yards on four catches, while Connor Brown had two receptions for a career-high 39 yards. Isiah Cox, DL Knock and Joe Lowery caught a pass apiece, going for 16, nine, and minus-3 yards respectively. Kent Berger and Marlin Brooks both had a sack for the Bobcat defense, while Amos Ogun-Semore and Sam McKnight shared a sack. Linebacker Evan Croutch picked up team-highs of nine tackles and seven solo tackles, with Brooks earning a team-best two tackles for a loss. Ford completed 27-of-38 passes for 355 yards and four scores, while Isabella earned game-highs of 198 yards and three touchdowns on 12 receptions. 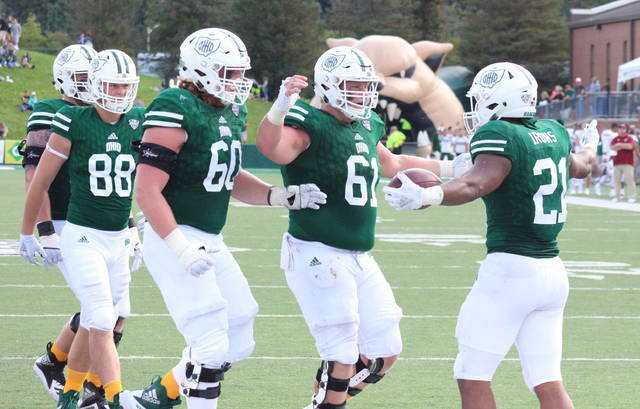 Ohio begins Mid-American Conference play at Kent State, with kickoff scheduled for 3:30 p.m. on Saturday.